Mazda are ensuring that their upgraded Mazda3 range will be exceptionally competitive as a company and fleet car when it is launched in early 2012. This is thanks to lower than ever emissions – with CO2 emissions being cut by up to 3.5% compared to previous models, and improved fuel economy. This results in lower petrol or diesel bills and Benefit In Kind (BIK) taxes for drivers, and lower National Insurance and Vehicle Excise Duty payments for the company. The new Mazda range comprises of 16 models, with a choice of two diesel and two petrol engines. Mazda are particularly eager to draw attention to the new Mazda3 1.6 Sport Diesel, which they believe will be very popular with company car drivers and their companies. Mazda have gone all out to combine luxury and efficient, economical running in this model. With CO2 emissions of just 115g/km, this new Mazda qualifies for the lowest BIK rate, 13%, during 2011/12. What’s more, it does a very impressive 65.7mpg, which Mazda believe will offer a saving of at least £26.88 a year, based on driving 12,000 miles per year and fuel costing 140p a litre. At £19,095 on the road, CAP predicts that the Mazda will have a residual value of 30% after 3 years or 60,000 miles. And this is in a car that comes with a Bose audio system, heated sports seats and 17 inch alloys as standard! Mazda’s most powerful engine in the new Mazda3 range is the 2.2 diesel, and yet there are still savings to be had. Both the Mazda3 2.2 Sport Diesel and the 2.2 Sport Nav Diesel drop a BIK class thanks to Mazda’s innovative engineering that allows each car to produce 5g/km less CO2. The Mazda3 2.2 Sport Diesel now delivers 150ps, and with CO2 emissions of 139g/km it is now in the 20% BIK class. Meanwhile the top-end Mazda3 2.2 Sport Nav Diesel provides 185ps of power and CO2 emissions of 144g/km, putting it in the 21% BIK rate. Mazda has improved the fuel efficiency on both cars too. The Mazda3 2.2 Sport Diesel now gives 54.3mpg, a 2mpg saving on the previous model. 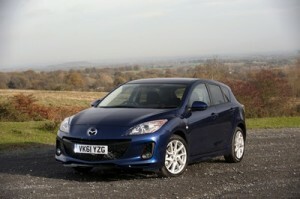 Even the sporty Mazda 2.2 Sport Nav has boosted fuel economy by reducing consumption to 52.3 mpg, a 1.9mpg improvement. If you’re interested in buying or leasing a new vehicle contact our sales team. Alternatively, visit our website where you will find new and used Mazda’s available for sale or on finance.